Established by Nuremberg church musicians in 1951, the Internationale Orgelwoche Nürnberg – Musica Sacra (ION) has today become one of the biggest and most prestigious festivals of sacred music and organ music world-wide. In 1968, the ION invited musicians to Nuremberg for an organ competition for the first time. After 1974, this competition was held annually and soon became one of the leading international events of its kind. The list of prize winners and jury members includes practically all important organ musicians of the past 35 years. After a break of two years, as of 2007, the ION organ competition will be held every two years, in the form of an interpretation competition. 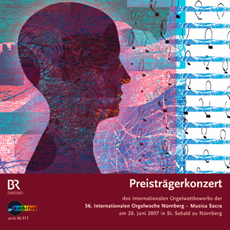 25 young organists from 13 countries applied for participation in the 2007 International Organ Competition of the 56th International Organ Week Nuremberg. First prize was awarded to Matthias Maierhofer; joint second prize was awarded to Saki Aoki and Maria Mokhova. On 28 June 2007, the prize winners’ concert was played, again on the organ in the church of St. Sebald. The three prize winners performed works from all competition rounds. The CD presented here is a recording of this concert made by Bayerischer Rundfunk (Bavarian Radio).